In recent years, structural pest management professionals (PMP's) across the country have seen advantages in offering green pest management (GPM) services. Schools, office buildings, manufacturing plants, and other entities are either writing bid contracts that specify green services or are showing preferences to pest control companies (exterminators) that offer these options. This has resulted in many state associations, such as the Illinois Pest Control Association, requesting green or related certification from state agencies that regulate their industry. In Illinois, the regulatory duties for this industry are shared by the Illinois Department of Agriculture and the Illinois Department of Public Health. IDA is responsible for pesticide registration in Illinois. IDPH is responsible for the training and certification of applicators, certification of businesses, and enforcement of the Illinois Structural Pest Control Act. Differences arise in whether state regulatory agencies are interested in responding to GPM requests and how they respond to them. Being state regulatory agencies, any change in certification typically requires a number of actions. First, there has to be an agency-accepted definition of GPM. This term can have many different definitions and caveats, depending on whether it is defined by pesticide applicators, environmental advocacy organizations, or other entities. Green Pest Management may require one or more of the following: Integrated Pest Management (IPM) methods of control, organic pesticide use, energy-efficient vehicles, energy-efficient routing of vehicles, low environmental impact uniforms and cleaning methods, or other measures deemed to reduce impact on the environment. Structural IPM may require one or more of the following: pest surveys through trapping or observation, action responses based on the type and number of pests found, the use of pesticide baits rather than sprays, the use of non-pesticidal control methods, or evaluation of control used. State regulatory agencies also require some method of measuring whether a PMP is conducting green pest management. This may require one or more of the following: evidence of attending educational sessions, knowledge testing, practical demonstration of knowledge, reporting of clientele served, or on-site observation of accepted practices. These tend to incur additional expenses to the state regulatory agencies, resulting in increased fees for certification. Finally, incorporating GPM or similar requirements by state regulatory agencies may require rule changes, statute changes, or both. Because there are many different ways to offer and regulate GPM, the Green Pest Management Committee of the Association of Structural Pest Control Regulatory Officials (ASPCRO) conducted a survey of state regulatory agencies. An email survey was conducted of these agencies with thirty-two states responding to the survey. There is apparently no data from Illinois in the survey report. Only two states, Georgia and California, reported that they had a definition of Green Pest Management. Georgia's definition is "Green Pest Management can best be defined as a service that employs an Integrated Pest Management (IPM) approach while utilizing fewer of the earth's resources as part of a larger effort to reduce human impacts on the environment." California's report of a definition for GPM referenced their existing definition of IPM and did not elaborate further on GPM. Four states reported having policies encouraging or promoting GPM. They were Arizona, Connecticut, Maine, and North Carolina. Many "green" pesticides are exempt from federal registration under FIFRA Section 25 (b). Twenty states reported that they require registration of these products. Three states (Pennsylvania, Indiana, Florida) reported that they require efficacy data for these products, although Florida only requires it for termiticides. One of the concerns about GPM is that some companies may make misleading or fraudulent claims, particularly related to advertising and claims of efficacy. Twenty-seven of the thirty-two states responding to the survey reported having the authority to take disciplinary action against pest control companies for misrepresentation or fraud. The same number of states has the authority or standards to regulate advertising by pest control companies. While only eleven states reported that they had the authority to regulate pest control effectiveness, many others indicated that they could do so through fraud or misrepresentation regulations. The survey asked for reports of complaints from clientele concerning Green Pest Management. Only New York and Hawaii reported receiving consumer complaints. Four states (New York, California, Florida, Washington) have conducted investigations related to GPM and five states (Maine, Maryland, Ohio, New York, Connecticut) reported dealing with "other issues" associated with GPM. If you've been working in the pesticide application arena in this state for over 10 years, you will likely remember Robert (Bob) Wolf. Wolf worked as an Application Specialist for the University of Illinois Pesticide Applicator Training (PAT) Program (now called Pesticide Safety Education Program, PSEP) from 1988 to 1998. He basically covered all the application topics and writings, but his specialty was in the area of nozzle technology. This is the position that Scott Bretthauer currently holds. Mark Mohr served in this role in between Wolf and Bretthauer. You may remember the portable spray table that Bob Wolf designed and built and used for demonstrations on reducing spray drift with proper nozzle selection and management of pressure. All told, 48 spray tables were built and distributed across the United States with the help of a USDA grant. Wolf was instrumental in 1994 for switching all the PAT general standards training material to PowerPoint presentations. At the time, most educators were still using overheads. Research interests lead Wolf to his current position as associate professor of biological and agricultural engineering at Kansas State University. He is currently being considered for promotion to full professor. 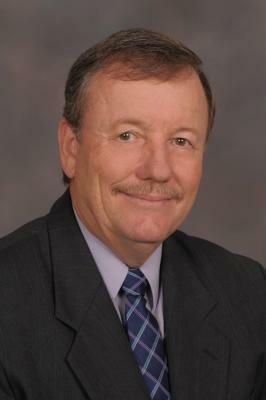 Wolf was recently named a 2009 Fellow of the American Association of Pesticide Safety Educators. The honor was presented at the August meeting of the North American Pesticide Applicator Certification and Safety Education Workshop in Charleston, S.C. Fellow is the highest recognition bestowed by the American Association of Pesticide Safety Educators. Individuals are nominated because of their superior achievement in research, education, public service, personal achievement and recognition. They must also have a minimum of 10 years of association membership. "Having this honor bestowed on you by your peers is an awesome experience and is very humbling," Wolf said. "I am proud to be a part of such fine organization consisting of great people. It has made my work very enjoyable." Wolf, also an extension specialist, is a nationally recognized expert on pesticide application technology. His research program has included the evaluation of sprayer technology to determine best practices to improve coverage and minimize spray drift. His contributions to drift mitigation programming and training have been paralleled by a 25 percent reduction of drift incidents over the past decade. Wolf is also recognized as an innovative trainer. Wolf is involved in both ground and aerial applications, and works with a variety of applicators and pesticide industries across the nation, including commercial field crop applicators, farmers, aerial applicators, golf course superintendents, weed scientists, turf care professionals, county weed directors, nozzle manufacturers, the agrichemical industry, state and federal regulatory agencies and spray adjuvant companies. Wolf is a charter member of the American Association of Pesticide Safety Educators, which is a group of educators dedicated to providing pesticide safety training and certification programs to protect human health and the environment. In the last issue of IPR, Phil Nixon wrote about recent court actions concerning pesticide applications and the clean water act. If you missed it, check out that article to learn more about this issue that will likely affect many pesticide applicators in Illinois. Included are examples of pesticide applications that would be subject to this court decision. As stated in the article, a National Pollutant Discharge Elimination System (NPDES) permit will be required for these types of applications. The rule would go into effect in April 2011. In Illinois, the Illinois Environmental Protection Agency is the state lead agency for responsible for issuing NPDES permits. EPA is hosting a Webcast to describe Agency efforts to develop a NPDES general permit for discharges from the application of pesticides in the few remaining areas nationwide where EPA is the NPDES permitting authority. This Webcast is scheduled for October 7, 2009, from 1:00 to 3:00 pm, Eastern time and is planned in preparation for the October 14-15 Pesticide Program Dialogue Committee meeting. EPA expects the 45 states that are authorized as NPDES permitting authorities (including Illinois) to use EPA's general permit to guide them in developing and issuing their own permits. The Webcast will cover current legal status of NPDES requirements for discharges from the application of pesticides; the schedule for developing NPDES general permits for such discharges, and current agency thoughts on general permit conditions related to the scope of general permit; Notice of Intent (NOI) for obtaining permit coverage; technology-based effluent limits; water-quality-based effluent limits; and monitoring, reporting, and recordkeeping requirements. The Webcast will be open to the public and is free of charge. A link to the Webcast will be available on EPA's NPDES training Web site. This site will be updated prior to October 7 to include a link to the Webcast. EPA is seeking public comment on a July 2009 petition from the American Bird Conservancy (ABC) requesting that the Agency revoke certain tolerances, or maximum residue limits in food, for 13 pesticides because the pesticides present an unacceptable risk to migratory birds. The named pesticides are: cadusafos, cyproconazole, diazinon, dithianon, diquat, dimethoate, fenamiphos, mevinphos, methomyl, naled, phorate, terbufos, and dichlorvos. The specific tolerances covered by the petition are tolerances associated with pesticide uses for which there is no U.S. registration and thus application of the pesticide is not permitted in this country. EPA allows Central and South American countries to continue using the pesticides on crops for which the U.S. has already determined there are unacceptable risks for protected U.S. migratory birds. The crop uses include green coffee beans, bananas, and other fruits and vegetables. ABC believes that revoking import tolerances for these crops will protect U.S. migratory birds on their wintering grounds in other countries and in the U.S.
ABC argues that revocation of identified pesticide tolerances is required by the Migratory Bird Treaty Act, the Endangered Species Act, and Executive Order 13186. Consistent with Federal Food, Drug, and Cosmetic Act requirements, EPA is requesting public comment on the ABC petition for a 60-day period ending on November 2, 2009. After considering comments received, the Agency will respond to the comments and the petition. For further information, please see EPA's September 1, 2009 Federal Register notice and the ABC petition in docket EPA-HQ-OPP-2009-0629 at www.regulations.gov. Due to their volatile nature, soil fumigants have the potential to pose risk concerns to people involved in the application (handlers), workers who re-enter fumigated fields (workers), and people who may be near the treated area (bystanders). EPA's Amended Reregistration Eligibility Decisions (REDs) for the fumigants chloropicrin, dazomet, metam sodium/potassium, and methyl bromide include a suite of measures designed to work together to reduce exposures, enhance safety, and facilitate compliance and enforcement. These mitigation measures include: worker protections, fumigant management plans, stewardship and training programs, good agricultural practices, buffer zones, posting requirements, emergency preparedness and response measures. The Amended REDs are based on public comments, new scientific data, and information submitted in response to EPA's July 2008 Soil Fumigant REs. For additional information, please see the Agency's Web page at http://www.epa.gov/oppsrrd1/reregistration/soil_fumigants/ on risk mitigation measures for the soil fumigants. Buffer Zones Fact Sheet. This fact sheet summarizes new requirements for buffer zones around fumigated fields. Buffer zones will increase protections for agricultural workers and bystanders – people who live, work, or otherwise spend time near fields that are fumigated. When new fumigant labels that require buffer zones appear in the market place in 2011, fumigant users will need to establish buffer zones around treated fields to reduce risks from acute inhalation exposure to bystanders. Posting Fact Sheet. This fact sheet summarizes new requirements for posting buffer zones around fumigated fields. It is important that bystanders stay out of buffer zones. When new fumigant labels with buffer zones appear in the marketplace in 2011, fumigant users will need to post buffer zones to ensure people know where they are and stay out. Worker Protection Measures Fact Sheet. This fact sheet summarizes new requirements to protect fumigant handlers and workers from fumigant exposures. When new fumigant labels appear in the market place in 2010, fumigant users will need to comply with these new requirements to protect fumigant handlers and other workers. Fumigant Management Plans and Postapplication Summary Reports Fact Sheet. This fact sheet summarizes new requirements for fumigant management plans (FMPs) and postapplication summary reports. When new fumigant labels appear in the marketplace around 2010, fumigators will need to ensure that a site-specific FMP is in place before beginning a fumigant application. They will also need to prepare a postapplication summary report to document any deviations from the FMP that may have been necessary, as well as results of air monitoring done during and after the application. Site-Specific Emergency Preparedness and Response Fact Sheet. This fact sheet summarizes new emergency preparedness and response requirements for fumigant applications. These requirements address potential risks to people who live or work near areas where soil fumigants are applied, in case the fumigant moves outside the buffer zone at concentrations of concern. New fumigant labels that appear in the marketplace in 2011 will require fumigators to adopt these measures. Applicator and Handler Training Programs: EPA is requiring fumigant registrants to develop and implement training programs for applicators in charge of soil fumigations on proper use and good agricultural practices so these applicators are better prepared to effectively manage fumigant operations. The registrants also must prepare and disseminate training information and materials for fumigant handlers (those working under the supervision of the certified applicator in charge of fumigations). Providing safety information to other fumigant handlers will help them understand and adhere to practices that will protect them from risks of exposure. The training materials must include elements designed to educate workers regarding work practices that can reduce exposure to fumigants, and thereby improve safety for workers and bystanders. Good Agricultural Practices: Current fumigant labels recommend practices that help reduce off-gassing and improve the safety and effectiveness of applications. The Agency has determined that including certain practices on labels as requirements rather than recommendations will minimize inhalation and other risks from fumigant applications. Several fumigant products already incorporate some of these measures on their labels. Examples of good agricultural practices include proper soil preparation/tilling, ensuring optimal soil moisture and temperature, appropriate use of sealing techniques, equipment calibration, and weather criteria. Application Method, Practice, and Rate Restrictions: The Agency is restricting certain fumigant application methods and practices for which data are not currently available to determine appropriate protections, or that lead to risks that are otherwise difficult to address. These include certain untarped applications for some fumigants. EPA is also lowering maximum application rates to reflect those rates needed for effective use, thereby reducing the potential for inhalation exposure and risk. Restricted Use Pesticide Classification: All soil fumigant products containing methyl bromide, 1,3-dichloropropene, iodomethane, and chloropicrin are currently restricted use pesticides, but many soil fumigant products containing metam sodium/potassium and dazomet are not restricted use pesticides. The Agency has determined that all of the soil fumigants undergoing reregistration meet the criteria for restricted use. Therefore, EPA will reclassify metam sodium/potassium and dazomet as restricted use pesticides. Compliance Assistance and Assurance Measures: Assuring compliance with new label requirements is an important part of the package of mitigation measures. Some states have mechanisms in place to obtain information needed to assist and assure compliance with new fumigant requirements. Therefore, in states that wish to receive this information, fumigators must notify State and Tribal Lead Agencies for pesticide enforcement about applications they plan to conduct. This information will aid those states in planning compliance assurance activities. EPA will work with all the states to amend their cooperative agreements with the Agency to include strategies for assuring compliance with new fumigant labels. States that do not choose to receive notification will need to document in their cooperative agreements their methods of identifying fumigant application periods and locations. Community Outreach and Education Programs: EPA is requiring fumigant registrants to develop and implement community outreach programs to ensure that information about fumigants and safety is available within communities where soil fumigation occurs. Outreach and information will address the risk of bystander exposure by educating community members about fumigants, buffer zones, how to recognize early signs of fumigant exposure, and how to respond appropriately in case of an incident. Researchers have found a surprising but reliable marker of colony collapse disorder, a baffling malady that in 2007-2008 killed off more than a third of commercial honey bees in the U.S.
Their study, in the Proceedings of the National Academy of Sciences, is the first to identify a single, objective molecular marker of the disorder, and to propose a data-driven hypothesis to explain the mysterious disappearance of American honey bees. The team included researchers from the University of Illinois and the U.S. Department of Agriculture, and the research was supported by the USDA. Illinois researchers spearheaded the honey bee genome project, which was completed in October 2006, less than a month before the first reports of colony collapse disorder (CCD) began to circulate. The new study made use of the genome and a genome-based tool, the microarray, to look for differences in gene expression in the guts of healthy honey bees and in those from hives afflicted by CCD. Such microarray analyses normally identify only active genes – those that have been transcribed into messenger RNA in the first stage of building proteins. But Reed Johnson, a University of Illinois doctoral student in entomology and first author on the study, noticed that the microarrays were turning up large quantities of fragmented ribosomal RNA (rRNA) in the bees affected by CCD. Ribosomes are the factories within cells in which proteins are made, but Johnson observed that this rRNA contained adenosine-rich sequences not seen in normal ribosomes. Such "polyadenylation" is believed to be a sign of ribosome degradation. When the team looked at the pathogens of healthy bees and bees from hives affected by CCD, they saw that the CCD bees suffered "more than their share" of infections with viruses that attack the ribosome, Berenbaum said. These so-called picorna-like viruses "hijack the ribosome," she said, taking over the cellular machinery to manufacture only viral proteins. The list of picorna-like viruses that afflict honey bees is long and includes Israeli acute paralysis virus, which was once suspected of being the primary cause of CCD.